When we left you last week, we were driving west on I-20, through a heavy March rainstorm that made the trip from Atlanta to Birmingham a soggy, gray experience. But before we get to Alabama's biggest city in the rain, a quick detour to a city that's drawn the short end of the move-in straw twice in the last few years. We speak of Anniston, a pleasant little town that has the misfortune of being 90 miles west of Atlanta and 65 miles east of Birmingham. And that, in turn, has made Anniston's FM and TV allocations fair game for poaching by move-in operators on both sides. On the FM side, Anniston had a nice, big 100 kW signal, WHMA-FM, at 100.5. That's "had," as in past tense, because after years of trying, the allocation was moved to College Park, Georgia, last year. "College Park"? Yeah, OK - that's really "Atlanta" to everyone but the FCC; even the transmitter is now right in the heart of downtown Atlanta, atop the Westin Hotel we showed you last week; the station is now Susquehanna CHR WWWQ "Q100." The former WHMA-TV, once a CBS affiliate on channel 40, is now WJSU-TV. It's still licensed to Anniston, at least, but look at that logo in the picture above: it's half of a two-station Birmingham rimshot ABC affiliate that goes by "Alabama's ABC 33/40." The other half, WCFT-TV in Tuscaloosa, is 58 miles on the other side of Birmingham; it too used to be a CBS affiliate, and Tuscaloosa and Anniston used to be separate markets. 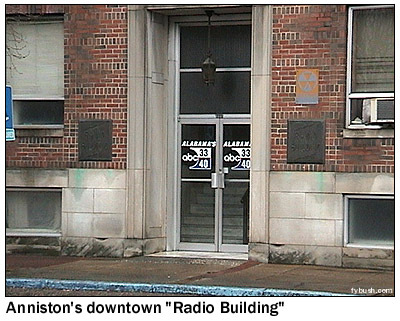 Today, they're part of a huge "Birmingham" TV market that stretches from the Georgia line almost to Mississippi, and Anniston viewers seeking local news have to be satisfied with a quick cut-in from the old WHMA "Radio Building" downtown. An hour later, and we were in Birmingham, meeting up with Troy Pennington, the president of the Society of Broadcast Engineers, for a tour of his stations, half of the market's big Cox cluster. The building at right is home to country giant WZZK (104.7), oldies WODL (97.3 Homewood) and 80s WBPT (106.9 "The Point") - and they were all running live and local that Saturday afternoon! Joined by fellow radio aficionado Chris Cuomo, we headed around Red Mountain for some amazing ribs at the Dreamland Barbecue, then back around the mountain to see everything else (in addition to those Cox studios) that crowns the top. Red Mountain is actually more of a ridge, slicing up to the southeast of downtown Birmingham, with newer suburban areas lining its western flank. It's a perfect location for towers, so it's no surprise that just about all of the major FM and TV stations in the market can be found up there. 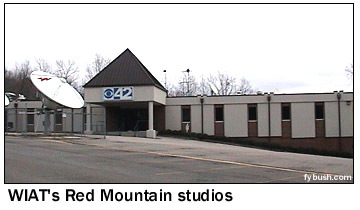 We began our tour about halfway along the ridge, at the Goldencrest Drive studio and transmitter of CBS affiliate WIAT (Channel 42). WIAT used to be WBMG-TV, one of three little UHF CBS affiliates in the region (remember WCFT and WHMA-TV? ), and for many years, it had no local news. Today, it's the lone CBS affiliate for the expanded market, and it does a fast-paced newscast without on-air reporters. Next door to WIAT is a smaller building marked "WPXH-TV 44." This is the Pax affiliate for the market, and while it located its offices with the rest of the TV crowd on Red Mountain, the Gadsden-licensed station transmits from a tower some 50 miles away, to the northeast. 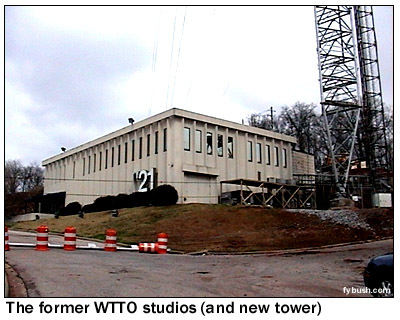 Up at the top of Goldencrest, we find two tall towers: one that's home to WTTO (Channel 21), the former Fox affiliate in the market, now WB, and a new tower next door that will eventually carry WTTO, WZZK and WBPT. 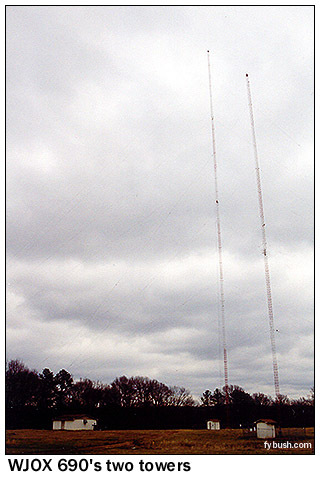 A shorter tower nearby is home to religious stations WBFR (88.5) and WGIB (91.9). 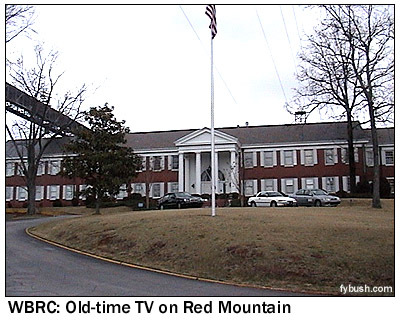 Our broad view of Red Mountain's big towers was shot from the southeast, not far from the Beacon Parkway studios of Cox, WTTO/WABM and the Clear Channel cluster in town. 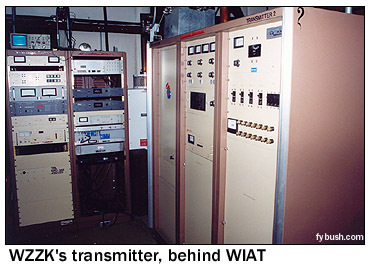 On the left are WTTO (with WBHK 98.7 side-mounted) and the under-construction WTTO/WZZK/WBPT tower); at right is WIAT, with WZZK side-mounted. And in the middle, in the distance, are two more towers. 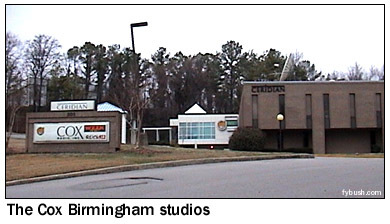 On the left is WBRC-TV, channel 6, Birmingham's second TV station. 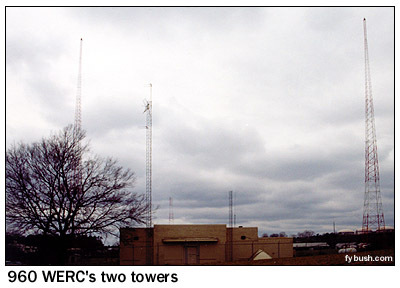 Side-mounted on that tower are PBS outlet WBIQ (channel 10), public radio WBHM (90.3) and WBPT (106.9), the onetime WBRC-FM. Just beyond WBRC, to the right, is NBC affiliate WVTM, channel 13, with WYSF (94.5) mounted below. Next door to WBRC's Southern-style studio (look familiar? WBRC, like Atlanta's WAGA, was once a Storer television station, and that's how Storer built its buildings) is the big, blocky home of WVTM, channel 13. This is the oldest station in town, having signed on a few months before WBRC as WAFM-TV, a CBS/ABC affiliate. 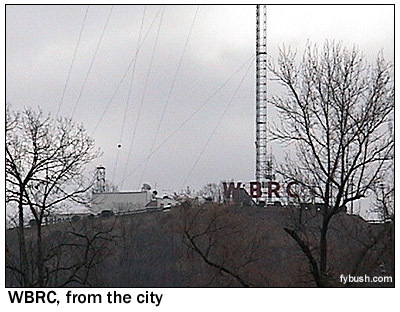 WAFM became WABT in 1953, then picked up NBC when WBRC went to CBS in 1954. And in 1958, it changed calls to match its sister AM station, Birmingham's oldest radio station, WAPI (1070), becoming WAPI-TV. 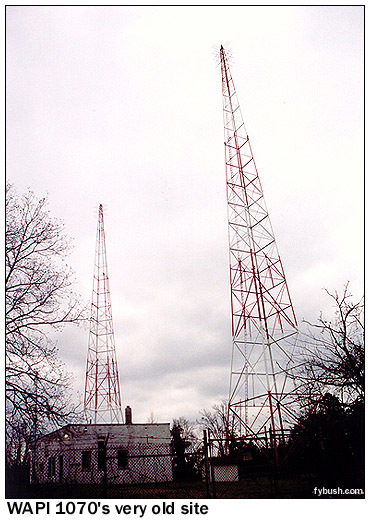 (At the same time, the former WAFM-FM became WAPI-FM on 94.5; it's now WYSF and is still on the channel 13 tower!) 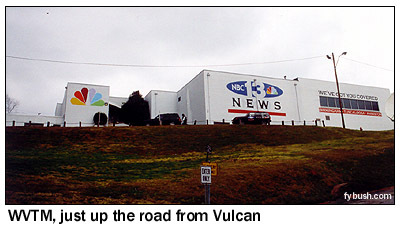 WAPI-TV became WVTM in 1980, "TM" for Times Mirror and "V" for Vulcan, as in the huge statue that perches on a tall pillar just down the road from channel 13. (He was off the pillar, being restored, when we visited). By 1994, WVTM was owned by a company called Argyle Broadcasting, which was eventually absorbed into New World Broadcasting - which already owned WBRC (and which would eventually be purchased by Fox, triggering all those affiliation changes in Detroit, Kansas City, St. Louis and so on) and thus couldn't hang on to two stations in the market. So in 1996, WVTM (and sister station KNSD in San Diego) were sold to NBC itself, creating two owned-and-operated stations up here above Red Mountain. But enough about TV - how about some radio? 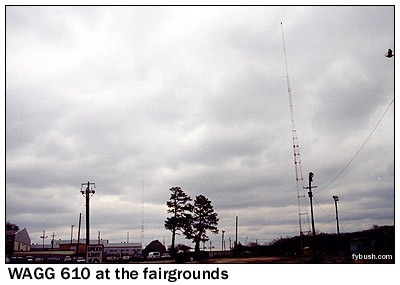 There's AM here as well, and for a long time, the big AM top-40 voice in town was WSGN ("South's Greatest Newspaper", for former owner the Birmingham News) on 610, operating from two widely-spaced towers on the Alabama State Fairgrounds, southwest of downtown. This is where Rick Dees got his first big break (in 1973), among other radio notables - but like so many top-40 AMs, WSGN couldn't survive the onslaught from FM in the eighties, segueing to AC and then adult standards. In later years, the station became WZZK(AM), simulcasting the FM, then WEZN(AM) (which is why the 99.9 in Bridgeport, Connecticut is now WEZN-FM); today it does gospel music as WAGG. Just north of I-20 we find Clear Channel talker WERC (960), the former WBRC(AM), with a history that goes clear back to the 1920s. 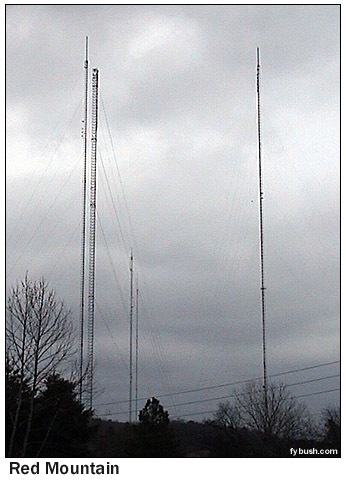 It split from the TV station in the early seventies, changing calls slightly in the process, but it's been using this two-tower site far longer than that. WERC, too, was a top-40 player in the market in the seventies, switching to news-talk in the early eighties. Continuing up US 78, we turn off at Forestdale, climbing the little roads of Sunset Mountain to yet another two-tower site, that of WAPI (1070). WAPI has a very long history, going back to its days as Alabama's first radio station, licensed to Auburn and operated by the university there (then known as "Alabama Polytechnic Institute." WAPI moved to Birmingham in 1929, and it's not hard to believe that this site dates back just that far. 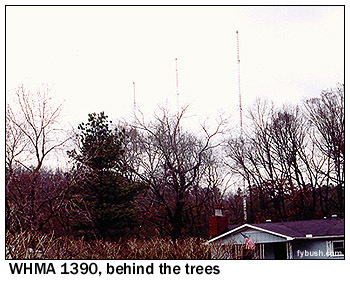 Look at those towers: could there once have been a wire dipole strung between them? And what are those spiky things near the top of both sticks? We weren't sure, but they were certainly different from your run-of-the-mill directional array. We were due in Huntsville by late that Sunday afternoon (March 3), so after WAPI we began the trek north, heading back around downtown (and passing the tower of religious WRJS 1320 along the way) and up Alabama 79. 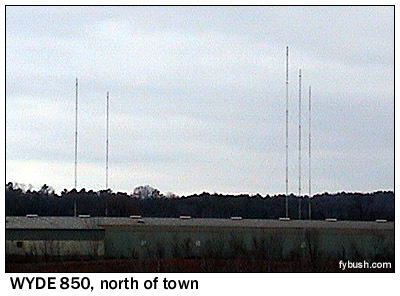 A few miles north of town, we passed our last Birmingham AM array: the five towers of WYDE (850). This is another 50 kW daytimer with night power (1 kW), and here's some trivia for our Boston-area readers: it was once known as WILD, before Bartell bought the station in the late fifties and moved the calls up to Beantown to be installed at 1090 on the dial. WYDE then became Birmingham's first top-40, as part of a pair with Atlanta's WAKE (1340, now WALR). And yes - you bet they called them the "WYDE a-WAKE Stations"! WYDE went country once WSGN and WVOK began challenging it in earnest; in later years it would do everything up to and including Radio Disney - and here's another irony: under that format, it changed calls for a while to WMKI. When 850 went back to WYDE in 1999, those WMKI calls went up to, yes, Boston, where they now reside at 1260 on the dial. WYDE has been doing conservative talk under Crawford ownership for the last few years; after our visit, Crawford bought WRRS (101.1) up north in Cullman, which will pick up the talk as WYDE-FM. 850 will go gospel, taking some of the programming now heard on Crawford's WDJC (for Donald J. Crawford) 93.7, which will go fulltime Christian contemporary. And that's probably far more than you wanted to know about radio and TV in Birmingham, isn't it? Next stop: Huntsville; see you next week!